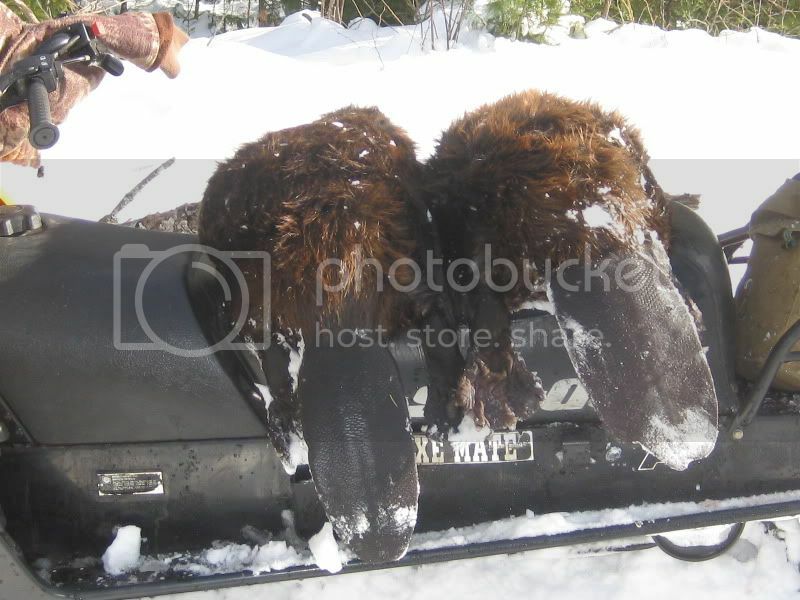 Register Log In Home Forums Wilderness Trapping and Living Archive Under ice beaver/conibear? How much for that trap? It really isn't that much "fooling around". The chairs are already built and you don't need to see down through the ice. Just cut a hole and place pole down so bait is about 4-6" from ice and your done. Give it a try, you may like it. We have found lots of sprung traps with baited conibears. We don't want to educate them and why carry conibears for baited sets when snares work just as good and are way lighter? The baited foothold has many versions but this version outperforms all others we have tried. The last batch of 14s were about $18 per. The above two pictures are the way I normally set my beaver bait poles. Water depth determines how many snares I put per pole and about 1 in 50 poles or so I will put six snares on a pole. It would be just like the four snare pole pictured with two more snares added. It is really quite rare here to have much over 6' of water (clear water) around a beaver lodge, and most often in the bogs I snare, the bottoms are quite soft (loon poop). To give you some history on how I came up with these setups, which I call Beaver Spikes, and why I use them. 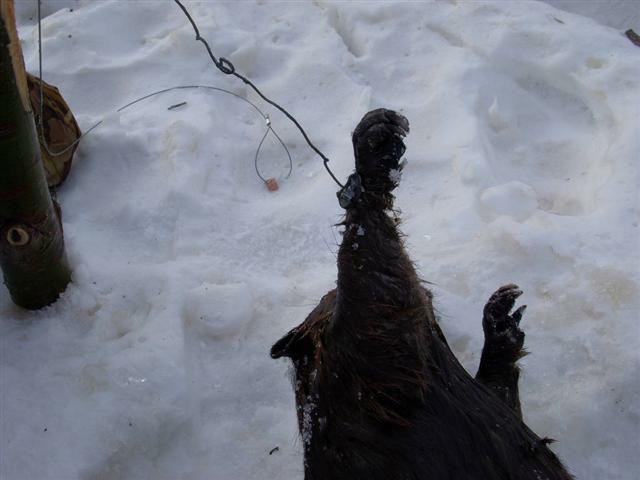 I have been snaring beaver under ice for a little over thirty years, Like everybody else who chops alot of ice and makes alot of snares, I have used alot of lock and cable variations. I've used 1x7, 7x7, and 1x19 cable, and a host of locks. Some were good and some I gave away in frustration.Some I bought in my early years had obviously been built by a person who had never snared beaver under ice.I don't believe in knocking other peoples products and will just tell you what I have come up with and how I got to this point. In my early years I used primarily 1x19 1/16" cable with a bunch of different locks, as that was what was preached in those days. It was common then, and still is today, to see poles with extensive frame works and multiple snares. They catch beaver, but take big holes to get them in working order, and take more time than I have found necesary. I find it faster for me to put down several poles like pictured above than to put a single frame with multiple snares and bait sticks. 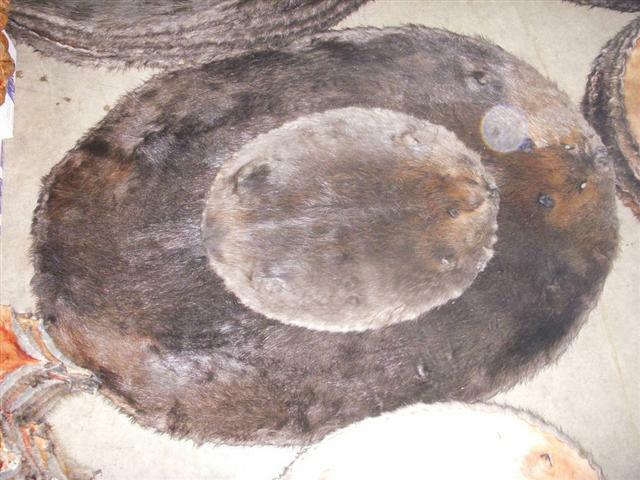 Most often when a beaver is caught they knock down most of the snares anyway, particularly a large beaver. I experimented with frame type setups and multiple bait sticks which employed tangle stakes outside the anchor poles with some success but still took way to long to make, but it definately increased my multiple catches. I used the 1x19 1/16" cable for about 12 years and caught plenty of beaver with it, but noticed some things I thought should be eliminated. I had minor white snare marks on the beaver and found them hard to feel under the ice since the cable and some of the locks I tried were so small. When I check my poles I don't pull the whole pole up unless I catch a beaver. I first wipe the ice clean on one side of the pole and chop a small hole just large enough to get my arm into. I then reach under the ice and feel for my top two snares, to see if they have been knocked down. If I catch a beaver on the bottom they have no trouble knocking down all the snares so I see no advantage to pulling the whole pole to check the bottom snares. I was doing decent with the 1x19 1/16" cable and even catching a few by the extremities(feet ,nose, tail), but was quite often having my snares pulled down to small loops (like pictured below) and nothing in them. Most often the cable also showed minor kinks in the cable,evidence of a beaver struggling some before getting out. What puzzled me the most was the loops were not always the same size or shape, but most often about a 1.5-2" loop. I was experimenting with different locks and some increased my hit miss ratio, some dramatically over others, but still was having way too many small loops with nothing in them. I was loading all my snares even back then and the weights and angles the locks approached the cable when set was noticeable, and affected the way I shaped the snares and their speed, and the way they fired, hung on the poles,and where I most often caught the beaver on their body. I learned from using snares that weren't loaded early on, that a snare has to be able to move to work and anything the loop came in contact with would slow it's closing or even cause a beaver to be able to completely swim through the loop, maybe just knocking it down with it's tail or back feet as it propells itself around the pole, often with the snare falling partially shut to like a five inch loop. Consider that a live, swimming, beavers body is the consistancy of jello and quite fluid. A snare has to close quickly and move freely. A snare that is not loaded has to be physically pulled shut from the beavers motion to catch it. A back foot catch is most often the result of a beaver swimming completely through your snare and picking the snare up on it's foot on the forward motion as it propells itself around the pole. A loaded snare should only have to be elongated about two inches to activate it, and the lock slides until it hits fur. 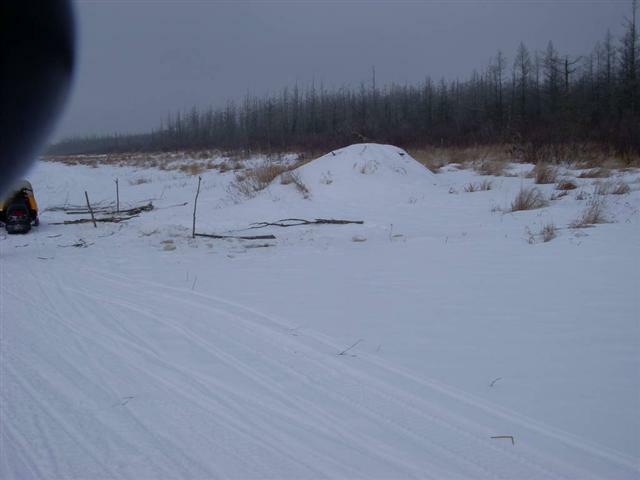 If the loop encounters anything during it's closing (like the pole, a stub branch,bundle of bait sticks, tips of branches in the feedpile, muskeg, or even an extremity of the beaver)it will hinder its closing. It finally dawned on me that the 1x19 cable was so stiff that it took a great deal of pressure to cause it to close down to a small enough loop to cature a beaver by the nose or front feet and that the minor kinks were evidence that indeed the loops were just sliding off their front feet and nose, and the ocasional larger elongated loops were from tail catches that were slipping off also. I was also getting tired of trying to feel the smaller cable with the gauntlets on and a pair of wool gloves under those, made it even worse during cold spells. At the time I was also using 5/64" 1x19 for coyotes so tried that next, for a short period of time. It was easier to put back in the hole through some slush, was easier to feel, loaded like lightning, and I had less noticeable marks. In over 500 beaver taken with the 5/64" cable i never had an extremity catch, and was getting quite a few snares pulled down to about a 3" loop and empty. Back to the drawing board! I didn't want to go to a larger cable, thinking it would be more visable and a deterent to the beaver, so I used 5/64" 7x7.My extremities catches went through the roof, I started catching otter that were playing around my poles regularly, and even caught some muskrats on my poles!!! I was a happy camper for quite awhile, and still use some of it regularly when otter season is open here. It was a little harder to push through slush than the 1x19 had been, but I could cut smaller slots and just get it started down the hole with one hand and I was in business. I cut my slots in the ice with a chainsaw so the sides of the holes are quite smooth when I first set. After that I have to make sure I get them clear of jagged ice on the edges when I first start down after remakes and catches. If I had to choose one cable for all my needs for my way of setting this would be it, but the majority of my beaver season , the otter season is not open.The 7x7 5/64 was as easy to feel as the 1x19 5/64" and the snare marks were not bad, but it is an otters worst nightmare under ice. It loads well, pulls down to nothing with most locks and works well at bank runs / house entrances, where the beaver are traveling faster, and is more subtle and form fitting. I'm a tinkerer, and can't stand it when I believe I can make something better, that will make my work easier.Snaring beaver under ice falls into that category with all the skinning and chopping. 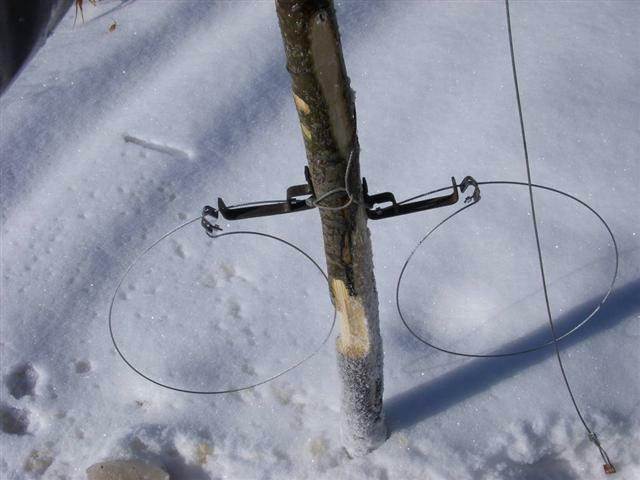 I had been using different support systems on my poles, most being some version of a wire holder with a support collar or the end of the wire crimped to the snare. 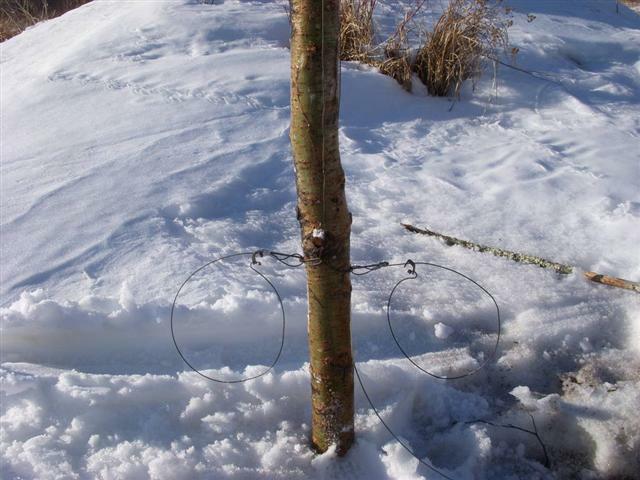 Then I went to using a cable that went through loops on the anchor end of snares and I fastened it to the bottom of the pole with a fence staple, and the top had an adjustable loop end to put a safety stick above the ice. The safety stick also held my pole in place until it froze in. 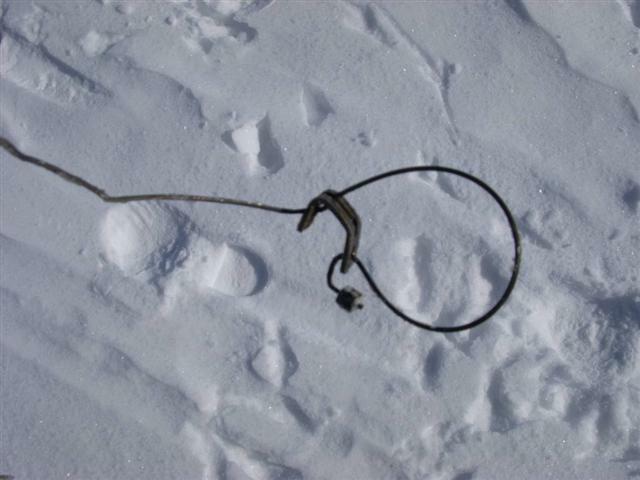 That system helped get my beaver down the pole where they could wrap up instead of freezing to the bottom of the ice, like the first wired on snares or long snares run down the pole and all anchored above the ice. Then I made the safety cables with a one way drowning locks on them to attach the snares to so the beaver couldn't come back up. All of them worked and each seemed to be an improvement over what I had been using, but still felt like it took too long messing around with a bunch of wire, and I ruined alot of gauntlets by poking holes in them while checking.Then I made a jig that would make what is best described as a long wire swivel, which I bent at a 90 degree angle at the eye of the swivel. I just kept making them longer until I got them to support my snare so that it just cleared the pole. This gave me an eye to put the safety cable through, I could adjust the angle of the snare on the pole by just bending it where I wanted. They lasted for a long time and about the only thing that hurt them much was me hitting them with my chisel while chopping to check.I caught alot of beaver with these too and a buddy of mine is still using them. They were held on the pole with a small fence staple, and the big beaver could always pull them off the pole but sometimes a small beaver would just wrap on the top and often be froze right in the hole. Yep, right were I start chopping at! The staples weren't any fun in real cold either because I couldn't hold the staples while wearing gloves. Back to the drawing board again. I then reasoned, if I could make a holder that would hold the snare ridgid, just off the pole,had an eye to run the safety cable through,and would fasten easier to the pole, I would have it made. That's when I came up with what I now call the Beaver Bracket. It is a piece of 1/2" flat stock bent into a wide U shape with one side shorter than the other, and another L shaped piece welded into one corner of that U to form a small square.The bracket allows the snare to swivel, is held on the pole with a roofing nail, which is retained with a small cross section of surgical tubing, which allows me to just pound it on the pole, where ever I want, while wearing gloves,has an eye incorporated to run my safety cable through, and stays on the pole long enough to ensure the lock has set when the beaver pulls on it, is tough and can take alot of chiseling LOL. and I even wax and die them for long life. I'd used these for about 6 years and started selling them to friends. Next thing I know I'm doing the convention circuit and making about fifty different snares. 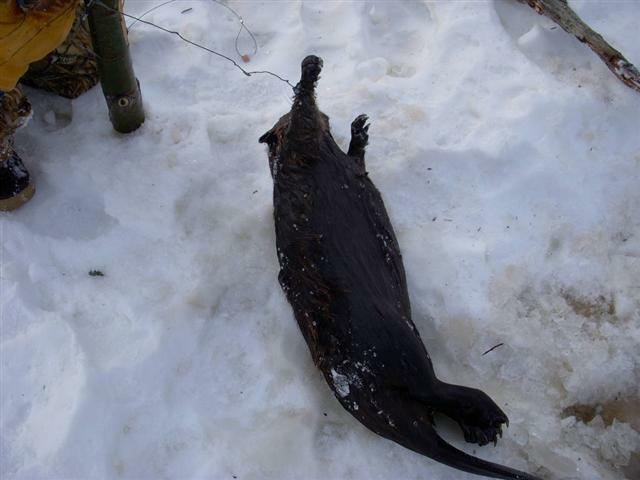 Over the years I'd caught several otter after season and we have to turn them in to the DNR. I was trying to find a way to eliminate the incidental otter and started using 3/32" 7x7 cable on the brackets. The stiffer cable was easier to feel, pushed through slush easier, left very faint to no snare marks and could often just be reshaped after catching a small beaver or a large one by the nose. My incidental otter catch went to near nothing.When I first started selling the brackets I was using all Reichert reverse bend washers on them for a lock. They are all loaded and quite fast, infact too fast. I had a few customers that reported they were lowering there poles through the ice and having their snares fire.I changed the angle on the bracket and now use the BMI Slide Free lock on all the brackets. They require a little more pressure exerted to the loop to get them started and my customers are reporting good results. I still use some Reicherts on my brackets as you can see in the pictures, I just use a little more finesse when I put them down and I have alot of them still. The bracket kits are $30.00 a kit and can be heavy, when carrying around a hundred or so.I got to playing with some ideas and came up with what is now the beaver spikes. A throw away snare that incorporates a nail, that works somewhat like the bracket. It's been a big hit with the market. It works well, sells for $22.00 a kit,weighs less, and you don't have to make replacement snares for it.It is possible to get over 150, with safety cables, in a square bucket, with a hatchet.A pretty good days work to get that many set. A spud and chainsaw rounds out my equipment needed to set all day.After I have a line established, I carry a snare bag that holds 4 dozen snares and 12 safety cables to check the line.I love traveling light, and that gives me enough for replacements and I can set a couple new colonies every day. That is pretty much how I came up with the snares I use today. In some of these photos you will see a few beaver , like the one above that were taken with 1x19 1/16" cable on spikes, with both Mini Reichert and BMI Slide Free locks. 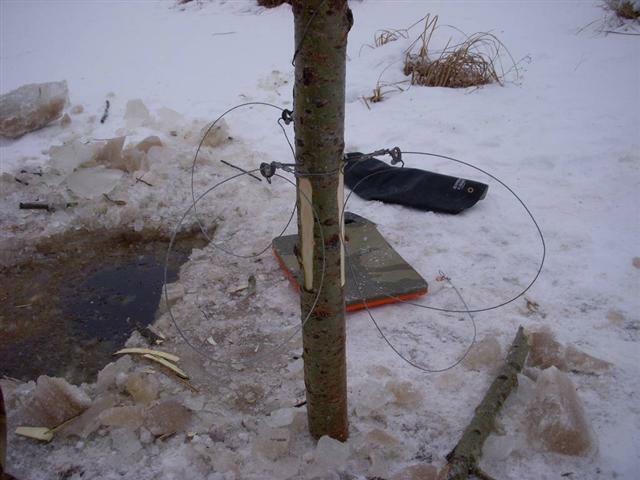 These were taken three winters ago, for a test of that cable, under ice for the BMP snare study. This is a picture of my new ride and the under seat tool box. 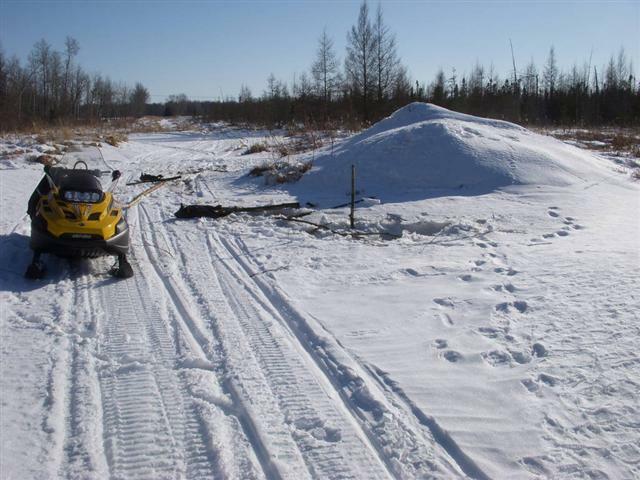 A Ski doo Skandic WT. I can get about 3 dozen snares, safety cables and a set of gauntlets under the seat. That's my idea of traveling light. Only have one season on it but I am pretty impressed so far. I'll let you know what kind of machine it is in about ten years. The two pictures above are from last season. This is a house on a CCC ditch. 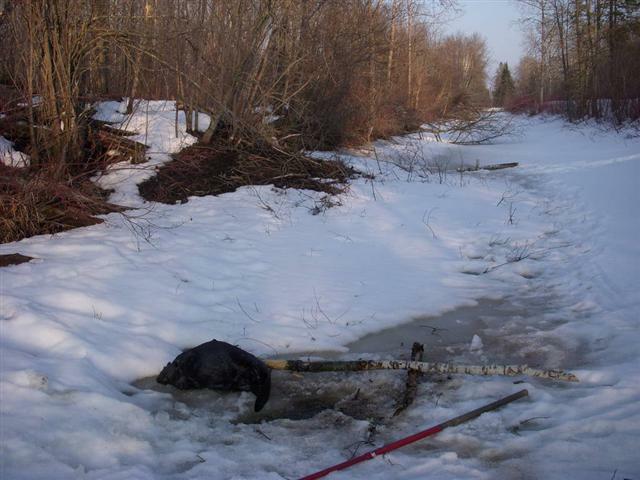 A forrester friend of mine asked me to trap it out so they could drain the ditch to access the timber west of it. One picture is facing south the other north, to show how I set it up. If you look to the south(first picture) you can see a dam. The beaver have a dam on both sides of the house and actually changed the direction of the waterflow. The tree line in the far south is the head of this section of ditch. 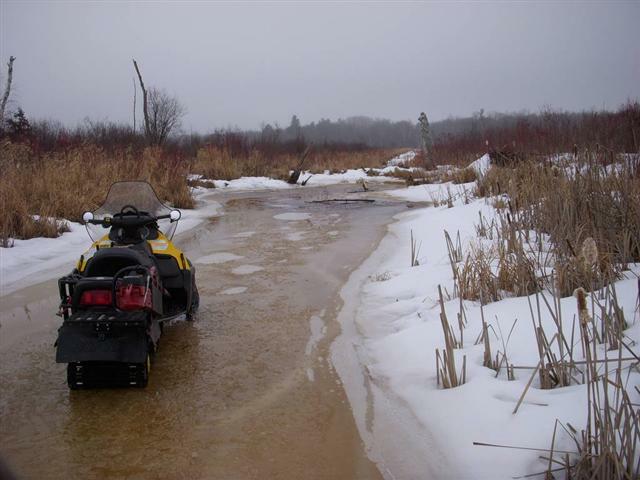 Where my snowmobile is sitting is about 3' of loon poop and very little water. I had to put poles in the runs coming out of the house to have enough water for them to work. Three of the poles only had two snares on them and were about five feet under the ice with only 18" of clear water. I just talked to a customer here in my shop and he had trapped this in the fall and only taken one two year old and a kit with conibears and footholds.I took five with the four poles. in three checks. A picture of some of my beaver from last year. Note the rats, I think their were 17 there. All but five caught on poles. Also notice the light snare mark on the beaver closest to the camera, taken with 5/64" cable most likely. In the second picture notice the tiny beaver laying on the big beaver. The two size extremes you can encounter and what you are asking a snare to catch. The big one measured 78" and the small one like 41". 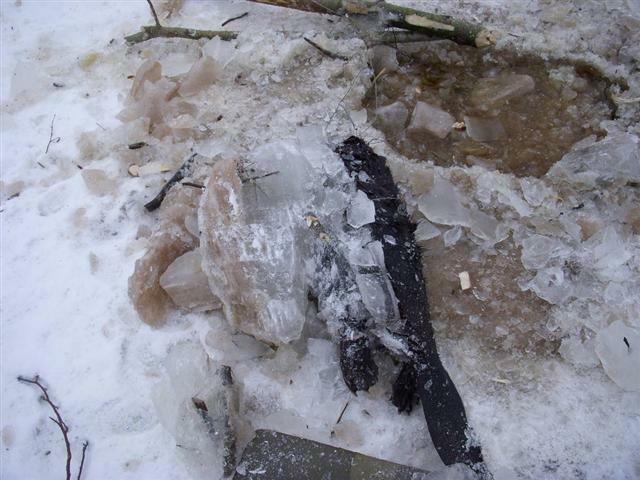 The first picture above this is what happens whe a beaver freezes to the bottom of the ice in a shallow water set, combined with a cold snap makes for alot of chopping to get my beaver out with no holes in it. The second picture is of a shallow water set I use. 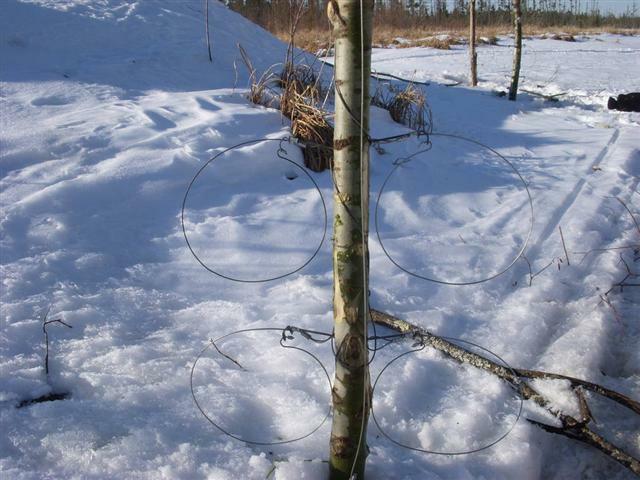 It is a series of three snares in a cloverleaf around the pole. I cut a triangle shaped hole with the chainsaw and put it under the ice, then move the pole over to one of the points of the triangle and set it on the bottom. I use these in areas where I have contracted to remove the beaver and can only access them by snowmobile. The beaver has nowhere to go since the snares are anchored at the top and often freeze to the bottom of the ice.My back was up against a snowmobile bridge when I took these two pictures and the beaver found it made a nice base for a dam.Took 19 beaver out of this flowage within a mile in either direction of this dam.Nothing better than easy access and a groomed trail in the middle.Expect alot of chewed up poles and empty snares with this type system. The reason is the beaver are sitting on the bottom and not swimming around the pole while they chew your pole. The chop marks on the pole will show their body position while they chew it. I use this when I can't locate a bank or house run and a feedpile is obvious. These two pictures above are of the same beaver, one taken a little closer than the first. 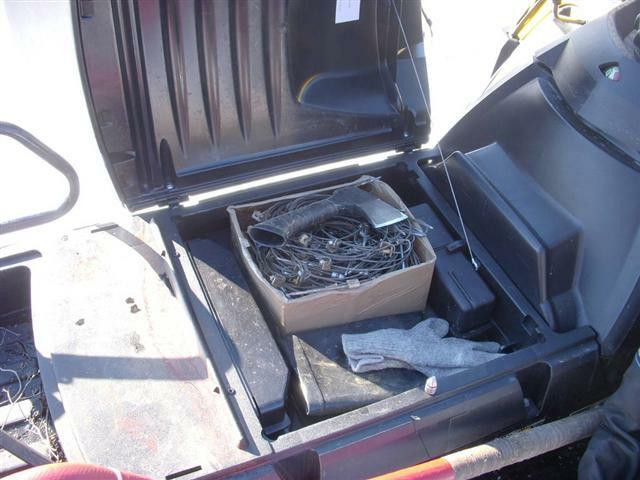 It was one I snared with 1x19 1/16" cable and Mini Reichert lock, during that BMP study three winters ago. This is a picture to give you an idea where I place my poles. This is an odd setup as far as their placement of the feedpile. If you look at the surrounding trees you will notice their isn't much for them to eat. These beaver are living on tag alders and willow. I have four poles at this location, you can only see three in the picture because the one closest to the house and to the right has been pulled completely under the ice. If you also look at the pole closest to the snowmachine you can see it is leaning. I had a double there that day. What is unusual about this house is where the feedpiles are at. They had stack brush on both shores on either side of the house, with two runs coming out of the house about two feet apart.The poles are sitting in the runs or real close to them. Took seven out of that house. This is in a WMA area and this is the main outlet ditch for about 30 square miles. Poor looking beaver area but it would take a semi to haul the beaver out of here that travel this ditch in a year. This is a picture of the same ditch only a mile farther East.The house is the dark spot to the right in the picture. I had three poles here, the one you can see closet has been partially pulled under water and the second one is leaning. The third pole is around the far side of the house and I never caucght a beaver in it. I had a double there that day and that was the only two beaver there. We had a four day warm spell and that is what caused the overflow. What you can't see in the picture is the amount of feed that these two beaver had aquired. All the way around the house was filled with small tag alder. I had to put poles in the runs because that was the only clean water ereas. I can't imagine how many trips these two beaver must have made to collect all that feed. It was a rather flat feed pile with very little above the water line but the overflow had completely covered it and refroze, or mostly so. Made for an interesting walk to that house and had to kneel on logs to reset. There was also a large house at the treeline, and about a mile farther east was the river these ditches drain into. This is a house at the headwaters of the above ditch. If you look to the right in the picture you can see the road grade of the two track that accesses this area. It doesn't look like much, but I have taken at least a pair of beaver out of this house for at least 12 years straight. The beaver just keep patching it up and every year pile the ditch full between the house and road grade. Every year I put a pole on each side of it and just have to park the snowmachine on the road and walk down the road grade. Wish I had about 200 more spots just like it. If you look down the ditch where the single spruce is that is where the dam is usually at. I was making a set there two years ago and a pair of moose crossed the ditch within twenty feet of me. They just looked at my snowmachine and kept on trucking. We don't have many in this area but this particular swamp is a stronghold for them. A young bull got hit about 17 miles away from there this spring, and may have been the same bull I saw there last year. I haven't been in there this year yet to see if itwas still there or not. This is a close up of what I have been referring to as a small loop when using the 1x19. It was common to have several a day like this when that was what I used, and also was common when I did the BMP tests a few years back. If you look close at the cable you will see minor kinks in the cable, which is common with my system. 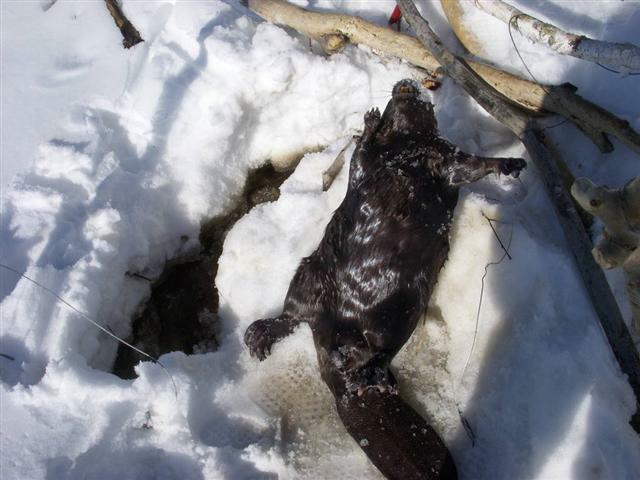 It is caused when the cable wraps on the spike or bracket opposite side of the pole while a beaver is fighting after being caught, or wrapped around the lower set of snares. I never had over about 10 percent extremity catches with the 1x19 1/16" cable, and currently catch 15-18% of my beaver by the extremities with the 7x7. The 15% being the 3/32" and the 18% being the 5/64 7x7. I'll try to get on here tomorrow and explain how I actually make my poles. Last edited by Rally; 12/31/10 06:27 AM. Here is the photo missing from above. Sorry that happened Rally. Some great shots you got on so far and I know there will be some professional advice to go with them. For those of you that don't know Rally runs a trapping supply business and snares is his specialty. He is great fun to talk trapping with when you order supplies. He gives you a lot of advice when you call and ask questions. He puts up a pile of beaver so we should add to our knowledge bank when he gets around to narrating this post. We will all be awaiting your commentary. What I would suggest is that you go back in and edit your post and put words to go with your photos. If as you do this hit the preview your changes you can keep track of what you have done. Even submit one photo or so at a time as you have time. Last edited by Family Trapper; 12/31/10 11:23 PM. Great pictures Rally! I'll be looking forward to your comments. Thanks! Thanks Rally, I will be starting to use your set up in a few weeks. I forgot how you cut hole in ice. I know with a chainsaw, I use same, but do you cut a " square" hole? Can not tell by your photo's on size of hole in ice. And do you cover them up with snow so they do not freeze solid?? Thanks again for the photo's and I need to order more of your snares, I should have bought more in Marshfield from you!!! Sometime try eliminating the nails and see if you like it. One piece of snare wire - two loops. It's called the Micky Mouse snare. Small loop in top middle where you wire it to the pole, and two loops on each side like yours, but one cable. I cut a slot about the size of a 28" chainsaw bar that is paralell to the hous and adj. to feedpile. Check back in a couple days and I'll add some better pictures. I used that system in various versions for about 12 years and caught plenty of beaver, but found it tough to use in slush, and often bent the support wires as I put it back in the water. The last year I used it it cost me about $90.00 in 31" gauntlets getting poked from wires. I had my best luck using that with a short snare that had support collars on them and then I ran a cable down the pole to allow my beaver to get away from the bottom of the ice. I bet if you tried some of the beaver spikes you wouldn't look back. I can set a pole faster than most can cut and form the wire. 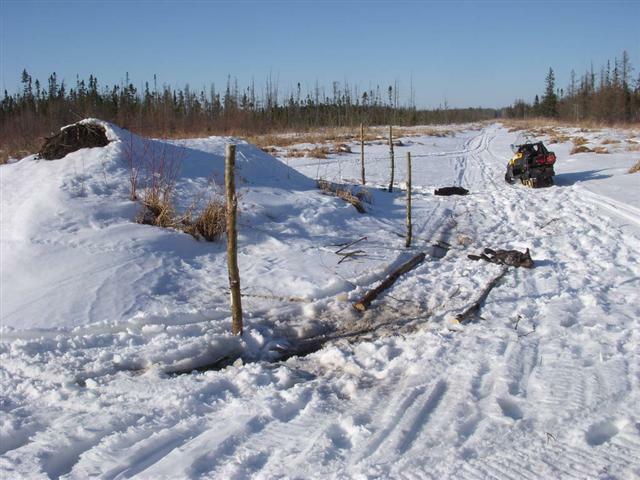 About 7 minutes to a pole including cutting the hole.The spike also allows the lock to set hard as the beaver makes it's first run to get away from the pole, but can be pulled off the pole to get to the bottom where it wont freeze to the bottom of the ice. Nice photos and info Rally. Thanks. I dont like where you parked your snomachine in that one picture though, lol....since there wasnt a story to go with it, that ice must have held!! Last edited by Hornhunter; 12/30/10 09:18 PM. I thought the same thing about the snow machine. I wish I could drive up to the huts here I just got back from setting an hour ago. Man am I beat! Rally, What cable are you using on your snares. I use the nails like you but the cable you use stands out as a better loop them mine. I load and shape all my snares so they close fast and are that shape. Has made a world of difference for me, especially on under ice beaver. Love them copper beaver. Just had a set of choppers made for the wife and I, out of some I caught.Do you catch alot that color in Maine? Rally, Just read what you've posted. It's been a great lesson, and well explained out. Thanks for taking the time to write that all down. Copper beaver, I'd say most of mine in this area have that colored guard hair. i don't travel very far and don't have alot of beaver around. 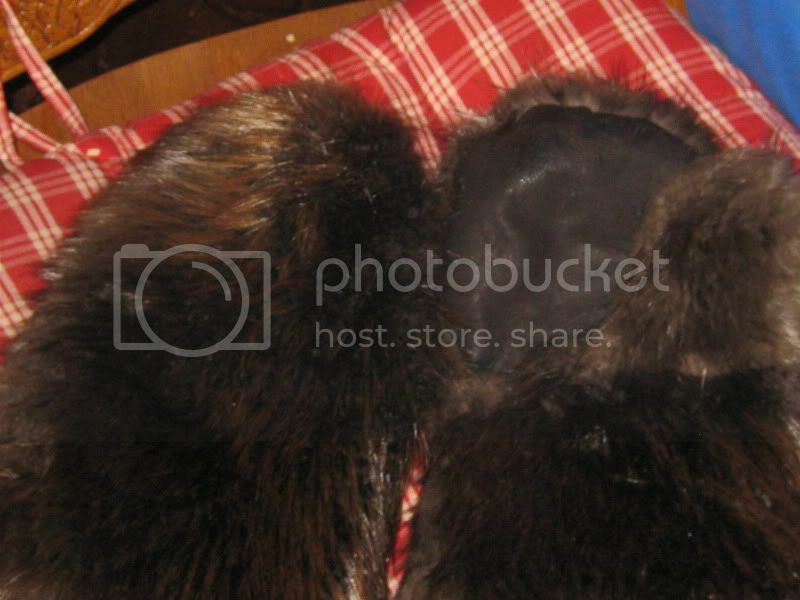 "Mountains".- Northern Maine has/ or had some real nice black beaver at one time. Eastern Maine has alot of low land swampy area. Beaver are plentiful over there and to the north. Before Christmas I know Neal Olson already had around 250 trapping open water. Picture is rather grainy. Had some choppers made also a few years back. That and my beaver hat makes for some smiles when encountered on a sled trail. These are the ones I just had made. The gauntlets are mine and the short mittens I had made for the wife. Sheared wool liners in all three, buffaloe on the palms and cuffs. The center pair are all buffaloe with removeable liners. 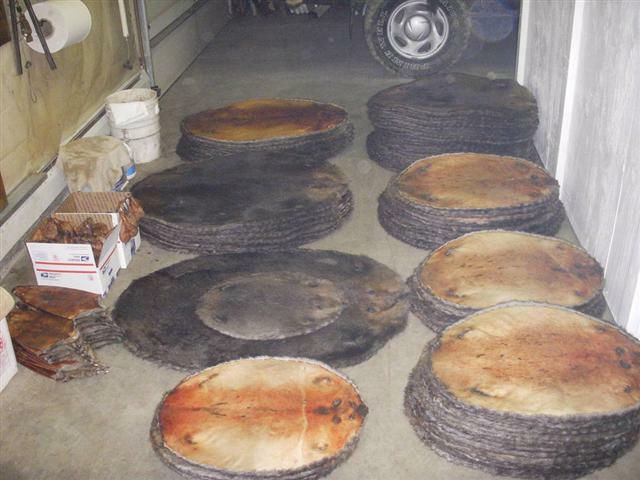 I'm going to use them for stoking my outdoor wood stove. Just got them back a couple days ago and haven't snowsealed them yet. Tough to tell in the picture but these are made of what I call "Copper Beaver". Take them out in the sunlight and they shine like a new penny. Most of my beaver are way darker than these. Wow Rally. Thanks for such an education. The photo are great. What is your experience with 1/16 7 by 7? 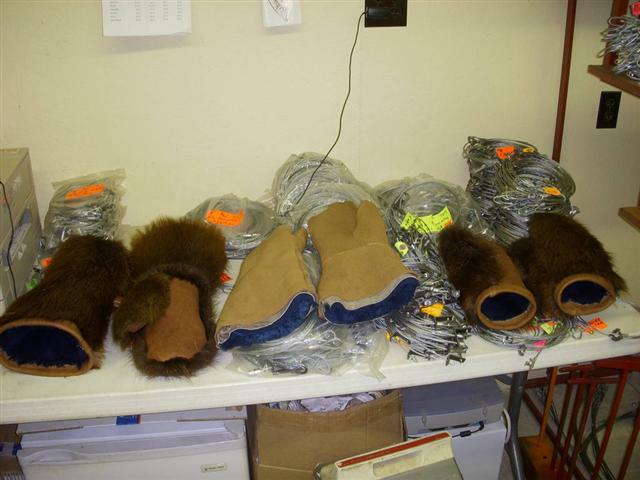 Wish Beaver hide prices would make a surge. Rally be carefull stoking that outdoor stove with those choppers. I have one ( Heat-More )and singed my beaver hat stoking her. I bet those buffalo hide palms are alot tougher than the ones i have. Do you always make sets just using the pole as bait. I've tried it that way, but seem to have more luck with pieces of bait nailed on the sides. I have some dark water, but usually it's quite clear. When you've made a catch how many have chewed the bait. I don't trap alot of beaver, but with 9 beaver from the snares I've only seen one stick chewed. And I think junior may? have done that after moma was attached to the pole. I had tried using a nail Instead of wire wrapped around the pole for supporting the snare. (Probably from your post on Trapperman before,) but can't remember how i came up with the idea. And I can't remember why I didn't continue using that method. You can see my snares here with Rally's attachment method of the nails. They do work slick. Here is one for you to try Rally. I have used an electric meter quite a bit for checking my otter conibears under the ice. I insulate my holes and they were usually in areas that did not collect a lot of ice generally if I covered them well. I would check usually once per week. However found that every two weeks was fine. Uncovering the holes and recovering them to check and empty set took a lot of time that could be better spent. Less time checking meant more time more traps checked on a Saturday. Took all of about 30 sec to stop my machine and check. Probably 5-15 to uncover, chop and recover. I was experimenting with using snares for otter and wanted to try and come up with a similar way to check my sets with the electric conductivity meter. Can't say that I used it a lot but this is a method that worked pretty good. It was based on the assumption that if the lower two snares held an otter all would be knocked down. The top one was the only one that read to the meter. So if either of the bottom two were pulled down you would not know it. However you could put a wire on each if you wanted. It used the snare wire to connect the circuit. One end of the two wire circuit was connect to the snare cable near the nail. The other end to the female bullet. A small piece of elec wire was attached to the snare. You can barely see it sticking out of the blue bullet. It fits in loosely enough that it connects but easy enough to pull out without much effort. Once you have the wires made up they would add only a little time to apply and save a lot of time. The more I look at this set up, the more i like it. Would be a little easier getting the hardware off the pole when pulling sets as well. And those locks seem to stay in place where the cams would fall down in that position.